Is it possible for a guest to use 1Password to log into a website without revealing the password? We are a very small marketing team that uses a lot of freelancers and contractors for our work. We would like some of these contractors to be able to post to our client's social media accounts, but DO NOT want them to actually be able to see what the password is. We were on the Family Plan, again, we have a very small team of only 4 employees, but we moved to the Business Plan because it looked like we would be able to have more granular access and filters for our guests. After a day of testing, we did grant a few guests access to a single vault and restricted them where they could only view the contents of the vault, but not reveal the passwords themselves. However, they can't actually open any of the websites or even use the information at all.... So what's the point of having the "view" filter? If we can't actually benefit from the additional guest filters we will go back to a Team Plan. However, it's starting to feel like we wasted our money upgrading, and we should just go back to the Family Plan - but it doesn't appear that's even possible. Sorry for the frustrated tone - I've just spent way too many hours today trying to figure this out. I'd be happy to help you get the most out of your setup. Before we get into that though I do think it is important to share some background information. 1Password Families isn't designed or intended for business use. We don't encourage businesses to use it. As for the 'reveal' permission it should be noted that someone technically inclined will still be able to discover the password once it is filled into the browser. We would highly recommend changing any credentials that have been shared with someone who is no longer eligible to have those credentials. That's your call, of course, but that would be our recommendation to maintain the highest level of security of your data. If you aren't concerned with one of these freelancers or contractors digging around in the guts of their browser to gain access then it may not be something you want to spend the time doing. To summarize: the 'reveal' permission is there to keep honest people honest. A skilled individual who wants to get the password will be able to get it. So, that said, to the meat of your question: these folks would need to install either 1Password X (which is probably going to be the easier solution) or 1Password for Mac / 1Password for Windows. 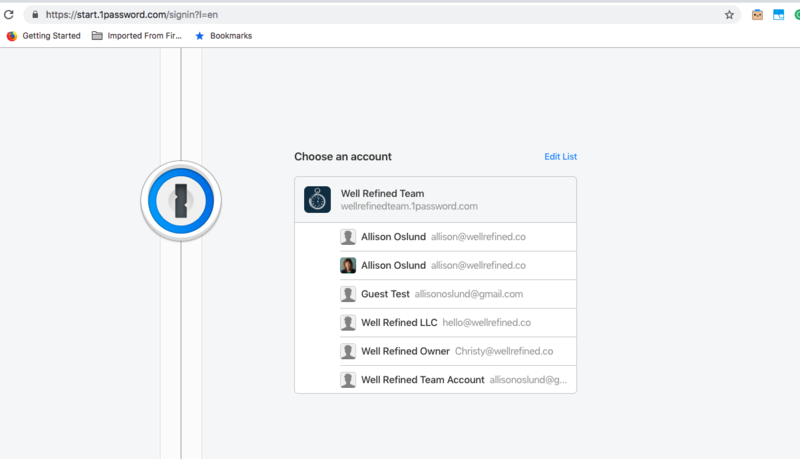 Once installed they would sign into their guest account within your membership using the same credentials they would use to log in on the 1Password website. This will allow them to fill, but not 'reveal' (if set), the passwords you've shared with them. Does that help? Please let me know. Thanks Ben - We'll try again tomorrow using 1Password X. I believe the contractor who was testing with me today was using 1Password for Mac, so we may be running into trouble there. We added and deleted an account for her several times as we were trying to work through all our permissions issues, so that may also be contributing to the problem. Is there someone I can email directly if we continue to run into trouble? I understand that the 'reveal' permission doesn't guarantee our contractors can't see them. Unfortunately, changing these passwords is up to our clients and their teams - we are just trying to do the best we can to protect them on our side. On an unrelated note, but something else that also came up today is there someone we can talk to about our 1Password invoice? Thank you very much for your help. Gotcha. That's fair. Not giving them the 'reveal' permission is certainly better than just giving them the passwords. On both counts I'd recommend reaching out to our business team via email at [email protected]. When you do you should get a support ID back automatically. Please post that ID here so I can be sure to flag your message appropriately. Thanks! 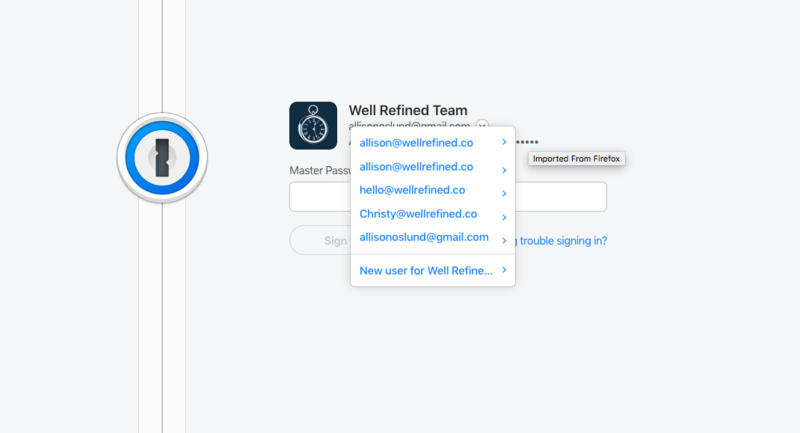 Ben - I sent a few different emails today to the [email protected] email address but haven't received a support ID. Sorry about that @aoslund. I do see we received the emails in the business team's inbox, and they'll be replying as soon as they can. I'm not sure why you did not receive the support ID. I'll be investigating that. But for your reference your support ID is [#PHJ-51826-925] (your two email threads were merged into one as they appear to essentially be duplicates). Ben - Is there a way to delete past accounts that have been deleted and are no longer needed? In our testing, we have added ourselves in as guests and as team members several times, and now have multiple logins to choose from. If you open your browser in private browsing / incognito mode do you still see those? I suspect these entries may be cached in your browser. They aren't there when I open an incognito window. I'll try clearing my cache and restarting my computer. Cache was cleared and computer restarted - they are still all there. Just saw the link to Edit List - was able to remove all the deleted accounts. I have been emailing with Jason about my invoicing questions, but he says he can't find any account for me. Can you help him? I actually was just discussing this with Jason, so he has seen this thread. Thanks.